In January 2001 when workmen were digging out the foundations for an extension to the school they discovered a number of objects which included broken pottery, a pot inkwell, mineral water/beer bottles, pieces of leather boots and shoes. 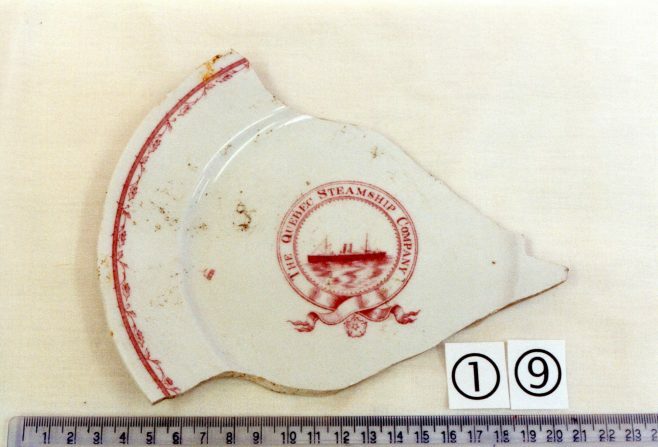 These caused great interest in the school especially to the children in Mrs Bramall’s class, and with the help of local historians each of the 54 items were photographed and logged. 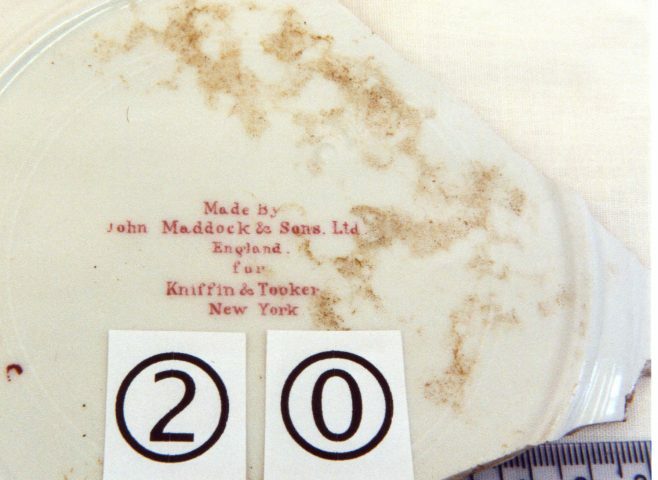 It is still a mystery as to why the objects were buried there as the first school buildings were erected in 1906 on what was previously a field, and Forest Town was in the very early stages of development. One piece of broken crockery (a plate No 19 & 20) is more intriguing for it has a logo of a steamship with the words ‘The Quebec Steamship Company’ round it. On the back it says ‘made by John Maddock & Sons, Ltd England, for Kniffen & Tooker, New York. 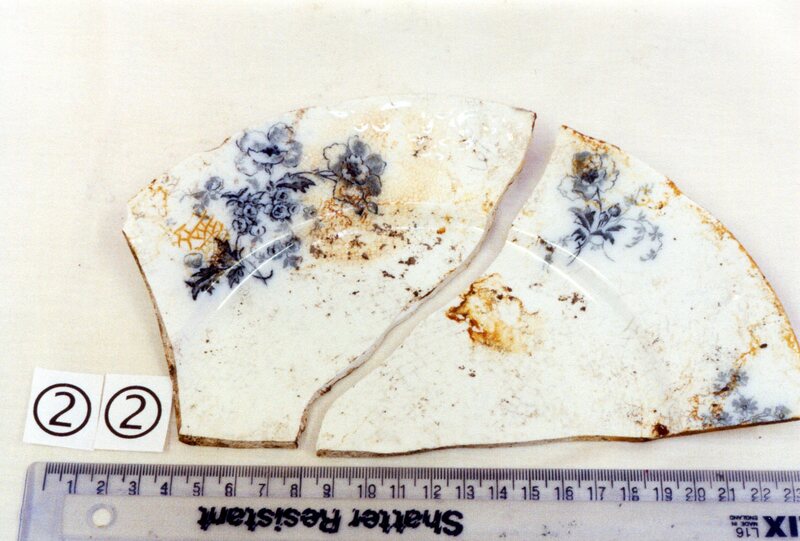 This suggests the plate is well travelled, the mystery is how did it end its journey in a field in Forest Town? 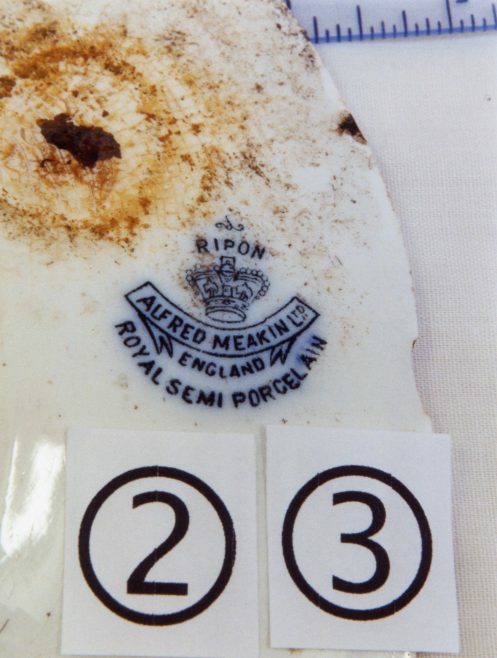 On the reverse side of two other broken plates (only one is illustrated), the name of Alfred Meakin Ltd. England is given and the words Royal Semi Porcelain Now whose dining tables did these plates grace? My mother worked for Meakins’ Pottery in Stoke-on-Trent in the 30s-40s.